So, this short film Moh caught my attention for two reasons – one that it featured Adah Sharma and the second reasons is its simple yet impactful trailer. I have been following Adah Sharma’ social profiles for a while now. She has got a fun, chirpy online presence that is a treat to watch and the same can be said about her movies. While many know her for Bollywood movies like 1920 (I still get nightmares watching it) and Commando 2 (badassery in abundance), her filmography is much bigger and exciting. Her film list includes movies in Tamil, Kannada and Telugu with many of them being big hits down south. So, apart from being a fan, I am babbling about her past film career because the trailer of her short film Moh seems to be quite different from anything she has done before. To give you more context, let me describe the trailer to you. The trailer has a simple setup. It is basically Adah talking to the camera throughout the one minute trailer. However, what she says is what makes the trailer intriguing. The trailer begins with Adah asking a simple question, “What do you want?” She then proceeds to list down things that seem incredibly relatable. Like everyone, at some point, wants a new car, the latest phone that has come in the market or a massive social media following. She hits a soft spot – “eating a pizza without getting fat”. All these wishes are some things that we experience or crave for almost every day. But then there is an incredibly short pause taken by Adah. In that pause, something changes. Though the wishes she states after the pause continue to be relatable, they seem different from the ones before. “Talking to someone for the entire day, to be loved by someone, to be lost in thoughts of someone.” After a point, the slight shiver in her voice too starts feeling similar. Because now, we are feeling heavy at heart. The wishes she stated before, now seem unimportant as the matters of the heart hit harder. Just then, what Adah says hits like a punch in the gut, “Sometimes what you want might not be exactly what you need.” That’s it! The trailer ends. Now, the mind and heart both are lost in a series of thoughts. We are thinking about things that we often forget or ignore in the daily hustle of life. But more importantly, it makes us curious about what Moh is trying to convey in its brief duration. With a sense of intrigue and melancholy in equal measure, I am certainly looking forward to this short film. If the trailer could deliver such an emotional punch, I wonder what the entire short film could achieve. 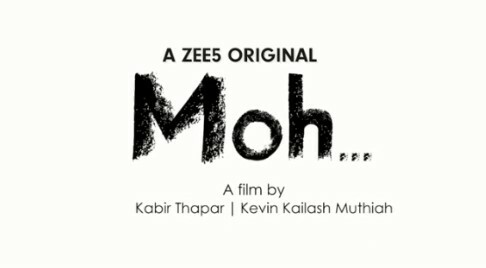 So, I shall be looking forward to Moh’s release on ZEE5 on 4th April 2019. Going by the looks of it, Adah’s digital debut seems like a winner already.